The week long trip covered the Cranberry Glades Botanical Area, Canaan Valley, Blackwater Falls, and Dolly Sods, each a place of outstanding biodiversity and beauty. 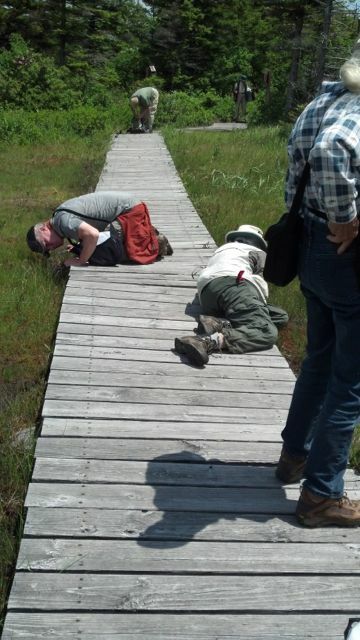 In this photo they are getting close to the small plants on the Northland Loop Boardwalk at Dolly Sods, looking at roundleaf sundew and other bog plants. One of the stops, Blister Swamp, is an interesting wetland that includes a circumneutral area with masses of Polmonium vanbruntiae, or Appalachian Jacob’s ladder, a G3 species. 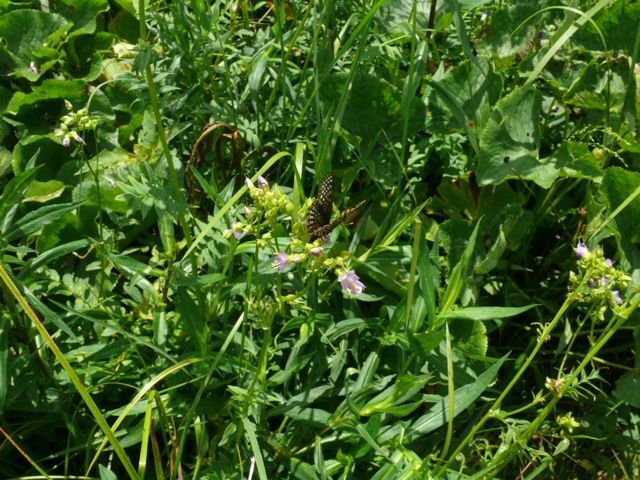 There Baltimore checkers, pink lined sulphurs, and other butterflies hovered in abundance. 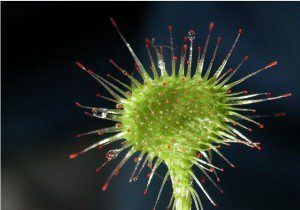 In the acidic part of the wetland, the sphagnum moss held Drossera rotundifolia (round-leaved sundew) and other plants of acid wetlands. Blister Swamp and the headwaters of Abe’s Run in Canaan Valley State Park have very unusual habitats called circumneutral swamps, highly specialized wetland habitats that support a unique, nutrient-demanding flora. They share a suite of plants that include a couple of G3 species like Glade spurge, (Euphorbia purpurea), found in Virginia only at Pinnacle Natural Area Preserve, and an upright Jacob’s ladder, (Polemonium vanbruntiae), which is not found at all in Virginia; as well as a native alder-leaved buckthorn, several sedges, and wetland grasses and willows. 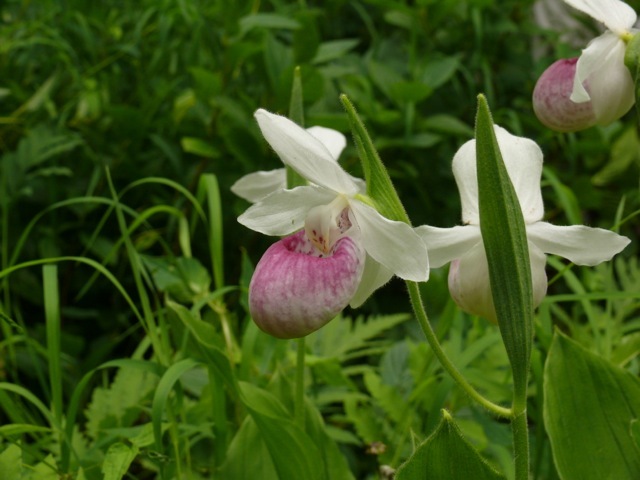 G3 plants are considered vulnerable, or at moderate risk of extinction due to a restricted range, few populations, recent declines, or threats of various kinds. The globally rare (G1) plant called running buffalo clover, (Trifolium stolonifera) was found at Fernow Experimental Forest. This clover has an interesting history: it originally spread in response to the migration of eastern bison, and now is often found in disturbed sites. It looks just like clover, except it has no markings on the leaves. Naturally they were thrilled to see about ten species of orchids, most of them in bloom, including a large, round-leaved orchid (Platantherea orbiculata). Another enjoyable and educational VNPS field trip! VNPS sponsors these extended overnight field trips twice a year, and members have priority for the limited spaces. Our fundraising this year will go to helping to locate and preserve the G1,2, and 3 plants in Virginia. 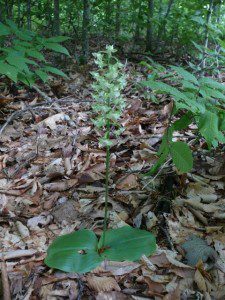 Join VNPS today, get priority on field trips, and give us a hand with those imperiled plants! Not to be picking at all, but only to correct geographical info in the general text. Specifically, Abes Run and Blister Swamp are in the headwaters of the East Fork of Greenbrier River, and not being near to Canaan Valley State Park. Blister Swamp being at the extreme headwater, and perhaps being a main source to the main stem of the mentioned river. Abes run is a tributary draining into the East Fork at about 5 or 6 miles below the wetlands of Blister Swamp. Hope this is helpful to authors and readers. Bill, thanks for taking the time to set the record straight!